Paulina and Kiyeon said, “I do” at an Oahu Beach Wedding right beside the ocean. We love the way this palm tree stood over them at Waialae Beach Park. It created the perfect tropical vibe for this destination ceremony! With their loved ones surrounding them, this bride and groom were excited and ready to get married! 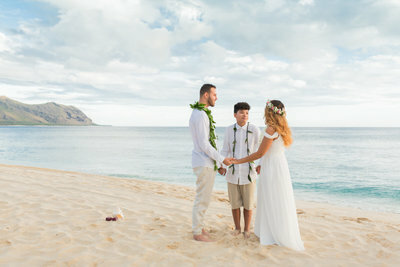 It was so special to watch as this couple joined hands and exchanged leis in preparation for becoming husband and wife. Aren’t they darling together?! Paulina chose a stunning wedding gown that complimented her natural beauty! The lace details and sweet neckline were so romantic and classy. We especially love that she decided to wear her hair in an elegant updo to further show off her dress! 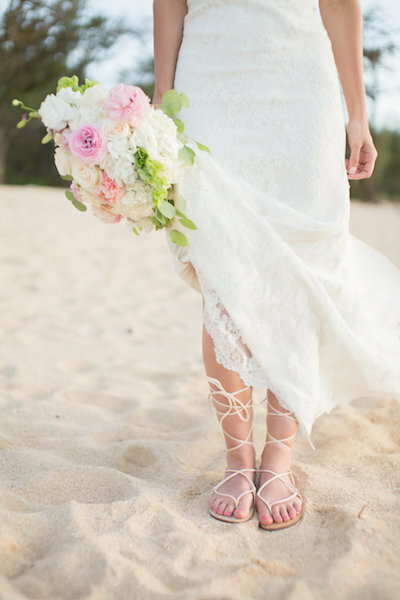 With her nails painted perfectly to match her Boho Dream Bouquet, this bride was dressed with style from head to toe. 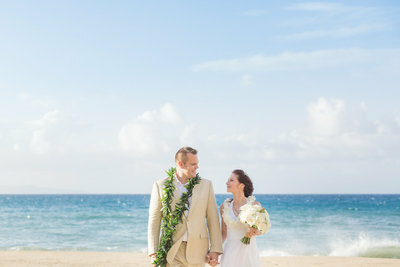 Her groom couldn’t keep his eyes off her during their Oahu Beach Wedding, just as it should be! 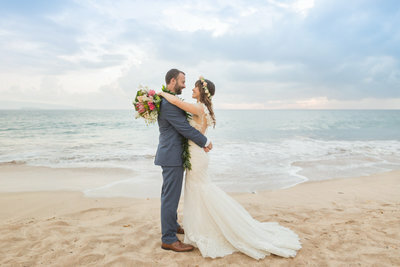 Thank you, Paulina and Kiyeon, for sharing this special day with Simple Oahu Wedding. Congratulations and Warm Aloha!